Plant prefers not to be buried in the substrate. You wrap this plant's rhizome around a stone or ornament with cotton thread and by the time the cotton dissolves the roots of this plant will have attached itself to the object. It is also a semi-aquatic emergent marsh plant and can cope in brackish water. It dislikes high levels of light (leaves go transparent). Very popular, cheap and common plant. Perhaps the most popular. Plant propagates by growing new plants at the tip of its older leaves. These tips turn black and eventually the Plantlet drops off to drift until its roots attach themselves to something. Most fish will not eat this plant, it has a bitter taste. 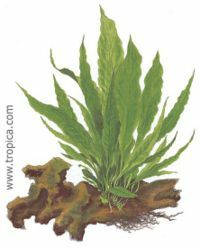 When grown with its leaves out of the water, it makes a good water nutrient absorber. Microsorum pteropus Red. (Red Java Fern) - Withdrawn by Tropica in 2007 as colour only appeared under emergent conditions. This page was last edited on 22 August 2011, at 12:14.